Meet The Owner – TW Restoration & Collision Inc.
Tony Wolter has taken his lifelong love affair with cars and turned it into an enjoyable and rewarding career. For more than three decades, Wolter has learned — and taught — the skills needed to transform a forgotten or damaged automobile into a head-turning showpiece. Along the way, he has worked on hundreds of vehicles, foreign and domestic, and has developed a keen eye for detail and an unmatched work ethic. Wolter is a native New Yorker who moved to North Carolina at age 16. His road to the body shop began when he got the chance to take college-level classes at Craven Community College in New Bern. “Cars were the thing,” Wolter remembers, saying he chose Auto Body Repair classes at the college and didn’t look back. Wolter has been making crashed and dented vehicles look like new ever since. 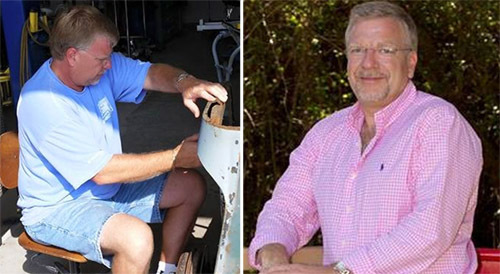 From the smallest fender-bender on a compact car to the largest full-scale restoration of a Jaguar, MG or a Corvette, he takes pride in his work. Several years into his career, Wolter returned to Craven Community College to lead the Auto Body Repair program, where he worked to instill the love for his craft to students. “I enjoy taking something damaged and making it look brand new,” he says, adding that his guiding principle for his business is to ensure the customer is pleased with the results. Wolter lives in New Bern. In his spare time, he likes to shag dance and, of course, to work on cars. Tony is also an ASE Master Tech and is I-Car Platinum certified.